Sales of unfaired bikes are rocketing – and now Triumph is going for a slice of the market with its new TT600-based Speed Four. Due to be officially unveiled later this month at the Brussels bike show shortly before making its UK debut at the MCN-backed Ally Pally show, the Speed Four combines the performance and handling of a 600 supersports bike with the aggressive looks of a streetfighter. Just because there’s no fairing, don’t think the Speed Four is a budget machine to compete with the likes of the 600cc Yamaha Fazer, Honda Hornet or Suzuki Bandit. Instead it will be targeting a more exclusive market. Expected to be priced at around £6000 on the road, the Speed Four as expensive as the bigger Hornet 900 – and will even face a challenge from Yamaha’s 143bhp Fazer 1000, which can be found in dealers for similar money. However, Triumph is counting on the allure of high-specification components to tempt buyers away from bigger, but more basic machines. Virtually every component comes straight from the TT600, but in many ways the Speed Four could actually be the better bike. While the TT600 lags slightly behind the best Japanese 600cc sportsbikes on overall performance, its handling is up there with the class leaders – and in every aspect it’s a league above bikes like the Bandit or Fazer. 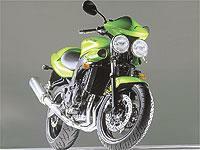 With exactly the same frame and suspension as the TT600, the Speed Four is set to have identical road manner. With a claimed 97bhp, the Speed Four’s engine is slightly down on the TT600, which has a claimed 108bhp at the crankshaft. This change comes from revised pistons, liners and camshafts aimed to give the motor a wider spread of mid-range torque rather than all-out power. As the bike’s lack of fairing means its top speed will be largely irrelevant, few people will miss the final few bhp – and the added midrange grunt could actually make the bike feel more responsive on the road. But riders might notice another potential benefit of the lower power output – in their wallets. The 97bhp figure was chosen because in some European countries there is an insurance break at this point, allowing the Speed Four to get cheaper cover. While UK insurers don’t follow the same scheme, they are likely to offer considerably cheaper premiums on the Speed Four than those for conventional 600cc sports bikes. Triumph biggest UK dealer, Jack Lilley Motorcycles, reckon the Speed Four could be a hit with customers. Boss Steve Lilley said: " It should be quite a flyer. If you look at the bike you can tell it hasn’t been built down to price – Triumph is going for a high quality bike rather than a cheaper, high-volume machine.
" I think sales will be good – after all, it’s a baby Speed Triple, and that’s our second best selling bike.
" The market is changing, with more riders looking for alternatives to sports bikes, and Triumph could be onto something with the Speed Four. It’s quite an exciting little bike. " Triumph can’t take all the credit, however, as the Speed Four isn’t a totally new idea. The firm’s Italian importer, Numero Tre, has been selling its own unfaired TT600s for more than a year under the " Baby Speed " name, and its success has prompted Triumph to make it an official model. The Speed Four is expected to go on sale in late January or early February with three colour options – black, orange or green.